The Lear Siegler ADM-3A terminal is a very important artefact in computing history. If you want to know why your shell abbreviates $HOME to ~, it’s because of the label on the ~ key on the ADM-3A. If you want to know why hjkl are the de facto cursor keys in vi, look at the symbols above the letters. The ADM-3A was the “dumb terminal” which Bill Joy used to develop vi. What does the "here is" key do? Indeed, what does the HERE IS1 key do? Its prominent position adjacent to the RETURN key implies whatever it does, it is important. So HERE IS, when pressed, transmits a predefined identification message. But what do to the words “message is displayed in half-duplex” mean? The answer to that riddle lies in the ADM-3A’s Answerback facility. Scanning forward to page 36, section 3.3.6 describes the configuration of the Answerback facility–programming the identification message transmitted when HERE IS is pressed. Pressing the HERE IS key or receiving an ENQ from the host … causes the answerback message to be transmitted to the host and to be displayed if the terminal is in half duplex mode. This is interesting, the remote side can ask the terminal “who are you?”. The HERE IS key is a vestige of a an older facility called Enquiry. Enquiry allowed one end of the connection to query if the remote side was still connected, and if it was, exactly who was connected. Answerback is a question and answer sequence where the host computer asks the terminal to identify itself. The VT100 answerback feature provides the terminal with the capability to identify itself by sending a message to the host. The entire answerback sequence takes place automatically without affecting the screen or requiring operator action. 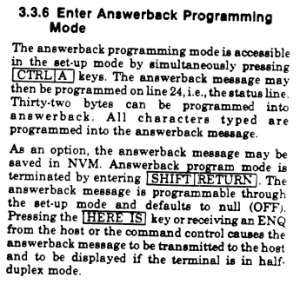 The answerback message may also be transmitted by typing CTRL-BREAK. This description is from the 1978 Digital VT100 user guide. It was certainly a simpler time when the server could ask a terminal to identify itself, and trust the answer. I’ve chosen to write the name of the key in all caps as the base model of the ADM-3A was only capable of displaying upper case letters. If you wanted lower case (above 0x5F hex), that was an optional extra. This entry was posted in History, Useless Trivia on August 21, 2017 by Dave Cheney. bytes.Buffer is a tremendously useful type, but it’s a bit large1. … and that is just the overhead, we haven’t put any data into the buffer yet. This Friday’s2 challenge is to write a replacement for bytes.Buffer that implements io.ReadWriter and allows the caller to discover the length and capacity of the buffer. The smallest and most creative solution wins fame, adoration, and a first run gb sticker. The code must continue to be correctly formatted. Points will be deducted for arguing with the judge (me). Everything you need to win this challenge is in the description; think laterally. As I hoped, most readers quickly figured out a good way to save a few lines was to declare Read and Write methods on a byte, not a struct. This would lead to some small complications dereferencing the value rather than treating it as a struct with a buf byte field, but everyone seemed to figure that out, which is good, as these are useful skills to have in your Go toolbelt. A few readers also spotted the deliberate loophole I left in the wording of the question around obtaining the length and the capacity of the buffer. Declaring a new type with an underlying type of a slice gives you access to the len and cap, so finding the length of a slice requires no additional methods on the type. Thus, the core of this challenge was to define a new slice type that had Read and Write methods, which would end up taking an overhead of 3 machine words, 24 bytes on 64bit platforms, 12 on 32bit. One nice property of this arrangement is that if you already have a byte slice, you can convert it into a Buffer and consume zero additional storage, as you are effectively replacing the 3 words that described the byte with 3 words which describe your new slice type. Kevin, I take my imaginary hat off to you, Sir. For the record, here was the solution I came up with last night. It is longer than I hoped it would be because of the odd contract that the standard library bytes.Buffer tests require. I think a more liberal reading of the io.Reader contract would result in a smaller entry. // methods. The zero value for Buffer is an empty buffer ready to use. // Write writes len(p) bytes from p to the Buffer. // Read reads up to len(p) bytes into p from the Buffer. So, prizes and glory to @rf, Ben Lubar, and @kevingillette, with special mentions to Egon Elbre, and Dan Kortschak and Douglas Clark from G+. Some of you were more correct than others, but you were all very quick, and that’s got to count for something. I’ll be in touch with your prize. If a reader wants to debate their solution, and possibly best ours, consider this an open challenge. I’m sorry if it isn’t Friday where you live. I can’t help it if Australians live in the future. This entry was posted in Go, Programming, Useless Trivia on June 5, 2015 by Dave Cheney. In this program, the size of variables of type x and y in memory varies by platform. By changing only one line can you ensure that variables of type x, and y always consume 16 bytes on all platforms that Go 1.4 supports ? Bonus points will be awarded for the most creative solution. ^uint(0) gives you a number whose bits are all 1, then >> 63 shifts the number 63 binary places to the right. If we’re on a 64 bit platform, this evaluates to 1, shifting 4 one place to the right leaves 2, otherwise 32 ones shifted 63 places to the right gives zero, and 4 shifted right zero times is still 4. Paul, my hat is off to you Sir. This entry was posted in Go, Programming, Useless Trivia on December 12, 2014 by Dave Cheney. It’s a little unfair to announce winners in some kind of order as I did post the quiz at an unfriendly hour of the day for most of the planet. With that said, Tim and William came up with a great map based solution at roughly the same time. You’ll have to split the winnings between yourselves. Gary came an interesting solution that works for almost all the integers. Gustavo Niemeyer takes double points for demonstrating that the first version of this problem could be defeated easily, and then proceeded to demonstrate his very mathy solution to fix Gary’s proposal. Several others also proposed some great shift tricks. Honourable mentions go to Charlie Somerville, for playing the man and not the ball and Francesc who proved that even with two attempts I couldn’t make the problem sufficiently water tight. Although the prohibition on adding more than one line was lost on Brendan Tracey, I think this proposal deserves to be highlighted. So with sensible, workable, and sometimes beautiful solutions out in the open, the race was on for the bonus points for the most creative. The first was my entry, which was the genesis for this quiz and goes to show, this why we cannot have nice things. Props for figuring this out goes to Arnaud Porterie and Gustavo Niemeyer who were both good sports and deleted their answer. I was feeling rather pleased with myself until Paul Hankin emailed me this fabulously creative effort. After that others tweaked to the loop hole that I had inadvertently left open by importing the fmt package. Congratulations to the winners, and thank you all for contributing. This entry was posted in Go, Useless Trivia on December 5, 2014 by Dave Cheney. By adding only one line can you make it print the correct answer ? Update: thanks to Gustavo Niemeyer who pointed out the first version of the quiz made it way to easy. Update: a few people have provided some very sound, rational solutions. Good job, give yourself a code review gold star. The bonus points for the most creative solution are still on the table. As a hint my solution will also work for this variant of the problem. The answer(s) will be posted tomorrow. Like all children who grew up in the 80’s, I was, and still am a huge fan of Ghostbusters. While recently re watching Ivan Reitman’s homage to New York, I spotted something which has gone unnoticed on the IMDB trivia page. This entry was posted in Useless Trivia on June 28, 2014 by Dave Cheney. Go has several ways to declare a variable. Possibly there are more ways than are strictly required but with the Go 1 contract in effect it’s not going to change. This short post gives examples of how I decide which variable declaration syntax to use. These are just suggestions, they make sense to me, but I’m sure others have equally strong justifications for alternative arrangements. As Go does not permit uninitialised variables, num will be initialised to the zero value. The key is that var acts as a clue that the variable has been deliberately declared as the zero value of the indicated type. The lack of var is a signal that this variable has been initialised. I also find that by avoiding declaring the type of the variable and infering it from the right hand side of the assignment makes re-factoring easier in the future. Of course, with any rule of thumb, there are exceptions. But maybe in this case min and max are really constants. This entry was posted in Go, Programming, Useless Trivia and tagged top tip on May 24, 2014 by Dave Cheney. There is an apocryphal story1 during World War Two, of a squadron of bombers leaving on a sortie. Time passes and finally a few bombers struggle back to their base, the crew shaken, but alive, their aircraft riddled with bullet holes. Shocked by their losses, the reaction by Air Force was to order the areas of the air frame wounded by enemy fire be reinforced with additional armor plating to improve the success of future missions. Fortunately for the Allies, a statistician engaged by the British raised the issue that the aircraft that had returned, although battle scared, were hit in places not crucial for flight. In comparison, their missing comrades had not fared so well. Having succumb to enemy fire, the damage their aircraft suffered could not be accounted for. Thus, the statistician argued, the portions of the aircraft which should receive additional armor should the places which did not suffer damage. This then is a tale about Selection Bias. Thirty years later, Frederick P Brooks, Jr wrote his seminal work, The Mythical Man-Month. Brooks’ observation that “adding manpower to a late software project makes it later” has become a rallying cry for the software development industry; one which we have had no shortage of opportunities to validate against a steady stream of prominent projects who over promised yet under delivered. However, for all our well founded chortling, I wonder if we are not succumbing to our own selection bias. For all the attempts to throw people at a floundering project is there a percentage of teams that quietly pull it off, meet their audacious schedule and live to code another day ? Is Brooks’ law an axiom of the software development industry, or are we simply counting the losers and drawing the wrong conclusion? If you want the real story, I suggest reading John D Cook’s post. This entry was posted in Small ideas, Useless Trivia on December 4, 2013 by Dave Cheney. At Canonical we’re increasingly invested in gccgo. While testing various packages built with gccgo we ran across test failures which we traced to an innocent looking piece of code. So, knowing that the Go spec defines the order of evaluation of functions calls and assignments as left to right, let’s try to predict what this code will print. So, is 238 the correct answer ? Well, at least it got the right answer, so is gc at fault or are the arguments actually evaluated in the opposite direction ? It turns out that both compilers are correct because the evaluation order of this sort of expression is not specified. In fact, in the spec, this case is called out in an example which is strongly reminiscent of the original code. The correct solution to this problem is to break the expression into two lines, removing the ambiguity about when the addition to d.i is visible. This entry was posted in Go, Programming, Useless Trivia on November 15, 2013 by Dave Cheney. This is a brief post highlighting a curious aspect of the declaration syntax in Go. But perhaps you didn’t know that the syntax is also valid for type declarations. For example, the following is valid syntax in Go. This entry was posted in Go, Programming, Useless Trivia on November 14, 2013 by Dave Cheney.